Don’t let your need for a business projector hold you back from enjoying blockbusters on the big screen at home. This versatile SVGA projector can do both. Even when there’s ambient light, its 3,300 lumens and 3LCD technology are capable of delivering a bright and clear picture. It’s incredibly long lamp life means it’s great value for money. The Epson EB-S41 is a fantastic projector for the mobile presenter and for small meeting rooms. The EB-S41 has the basic resolution of SVGA, if you are showing detailed images this would not be suitable as it is not sufficient enough. I would recommend going up to at least XGA as then you will be able to see a smoother and more defined image. SVGA is however perfect for Power Point presentations and simple graphics. This projector has a high brightness of 3300 lumens so you can project with light coming through the windows, no need to close the blinds! The high contrast ratio contributes to the image quality, making the blacks stand out from the whites. This LCD projector effortlessly displays bright images with vivid colours for a crisp, clear picture. The LCD technology used in the EB-S41 gives you clear and realistic colours. 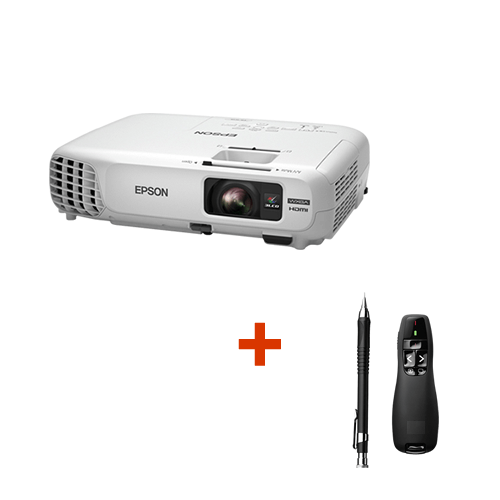 The Epson EB-S41 has a standard zoom throw ratio so you can adjust the image size without having the need to move the projector around. If you are 1m away from the screen, you can expect a 69cm wide image. With an HDMI input, high definition video and audio content are easily played with the same high quality you would expect from Epson. This allows you to connect to most devices without having to buy adaptors. There is also the 2 in 1 USB port allowing you to show image and mouse control from a single USB cable. You can even present PC free with a USB cable. The EB-S41 has a great lamp life of 10,000 lamp hours. This projector is quick and simple to set up. No matter the angle of the projector, you can easily align the projection to ensure a straight and correct image thanks to its keystone correction. 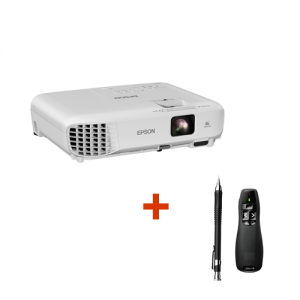 This is a great projector for presentations and comes with a carry case so it is a great mobile option. Epson are a fantastic manufacture and offer a 2 year warranty. Click on the PDF to the left for more information. Whether you’re watching blockbusters or delivering a presentation, this projector can achieve an impressive 350-inch display. It’s great quality too with 3LCD technology that makes the display up to three times brighter than competitor products2. In addition to its bright and vivid colours, the 15,000:1 contrast ratio produces defined shadows and deep blacks. From family and friends to business colleagues and clients, it’s sure to get everyone’s attention. Even in bright rooms, this powerful yet affordable SVGA projector delivers exceptionally bright yet colourful images with clear details. It’s all thanks to 3LCD technology, which produces an equally high White and Colour Light Output of 3,300 lumens. Looking for a long-term, hassle-free and affordable solution for your projection needs? With this model’s long-lasting lamp light source, you could watch a film every day for 15 years1.